From the National Book Award–winning author of Let the Great World Spin, this haunting novel is an examination of intimacy and betrayal in a community rarely captured so vibrantly in contemporary literature. Zoli Novotna, a young woman raised in the traveling Gypsy tradition, is a poet by accident as much as desire. As 1930s fascism spreads over Czechoslovakia, Zoli and her grandfather flee to join a clan of fellow Romani harpists. 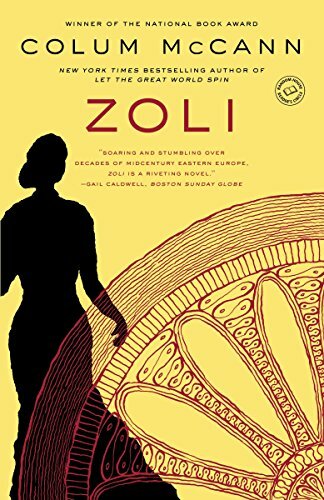 Sharpened by the world of books, which is often frowned upon in the Romani tradition, Zoli becomes the poster girl for a brave new world. As she shapes the ancient songs to her times, she finds her gift embraced by the Gypsy people and savored by a young English expatriate, Stephen Swann. But Zoli soon finds that when she falls she cannot fall halfway–neither in love nor in politics. While Zoli’s fame and poetic skills deepen, the ruling Communists begin to use her for their own favor. Cast out from her family, Zoli abandons her past to journey to the West, in a novel that spans the 20th century and travels the breadth of Europe. Colum McCann has created a sensuous novel about exile, belonging and survival, based loosely on the true story of the Romani poet Papusza. It spans the twentieth century and travels the breadth of Europe. In the tradition of Steinbeck, Coetzee, and Ondaatje, McCann finds the art inherent in social and political history, while vividly depicting how far one gifted woman must journey to find where she belongs.